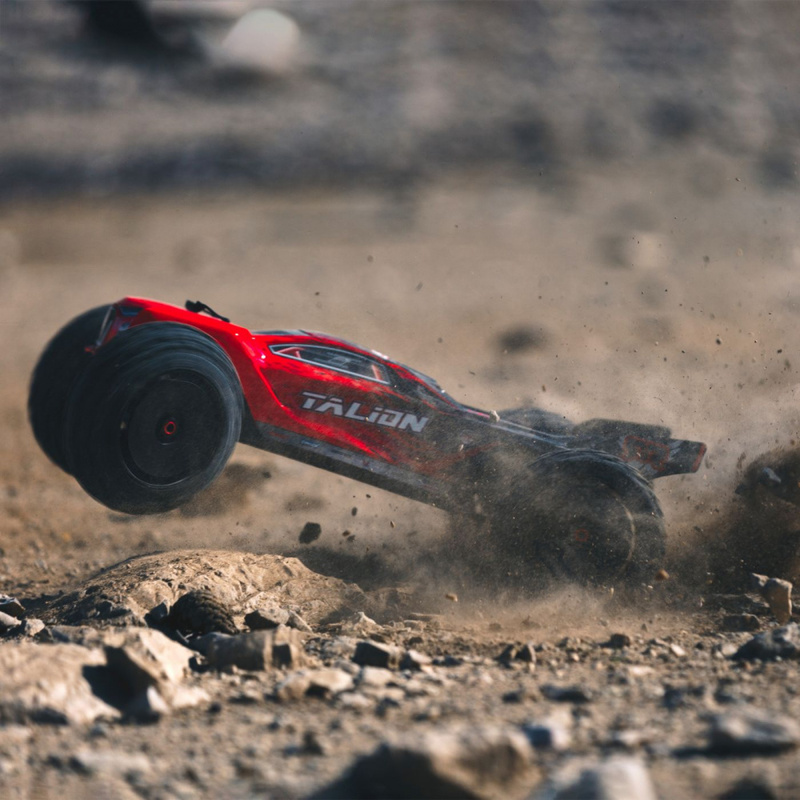 Engineered to bash, designed to thrill - the 1/8 scale ARRMA® TALION™ 6S BLX 4WD speed truggy reaches 70+ mph right out of the box. Now comes complete with the 2.4GHz Spektrum™ STX2® radio system, it's tough as nails and ready for fast action on any terrain! 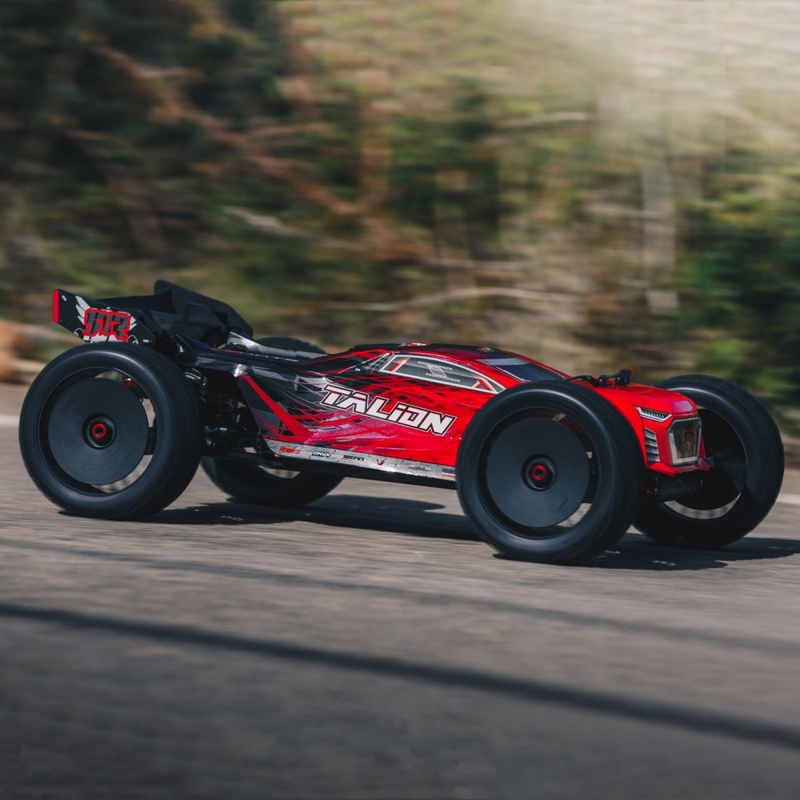 Powerful, 6S-capable brushless electronics enable this new TALION™ Speed Truggy to satisfy any intermediate-level basher's need for speed. Its 2050Kv brushless motor is paired with the BLX185 ESC, featuring IC5™ connectors and compatible with standard EC5™ connectors. The waterproof electronics accommodate all-weather bashing. 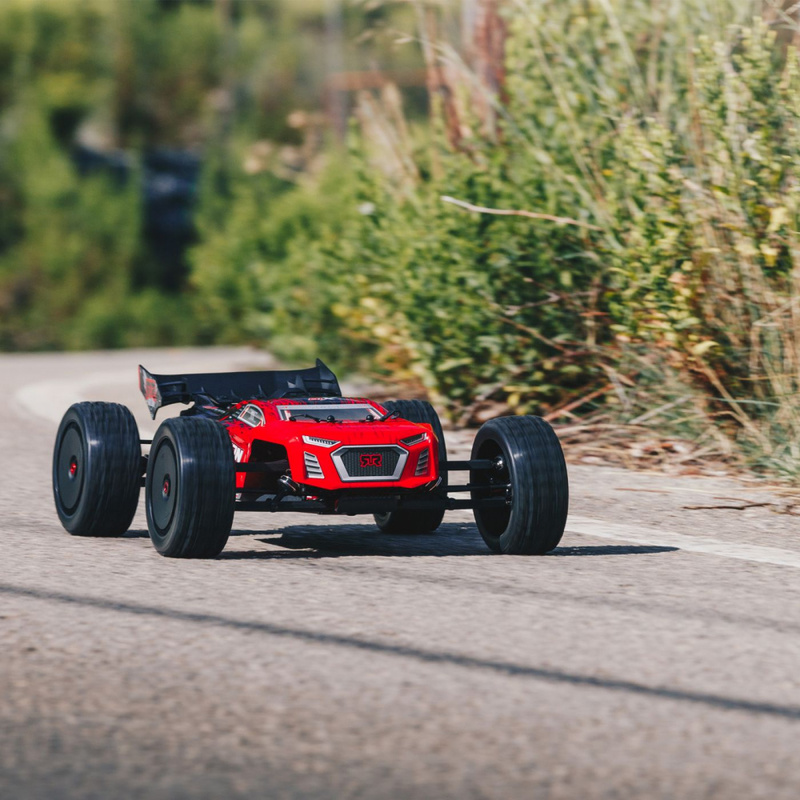 Add your favorite 4S or 6S LiPo battery and watch this truggy smash your bashing speed expectations, especially while running with the optional recommended pinion gear. Low-drag MT wheels with extra-strong hubs arrive outfitted with aggressive, multi-surface DBoots® KATAR tires. A multi-element, high downforce wing helps keep the truggy grounded. Both contribute to confident control and responsive handling on- or off-road. 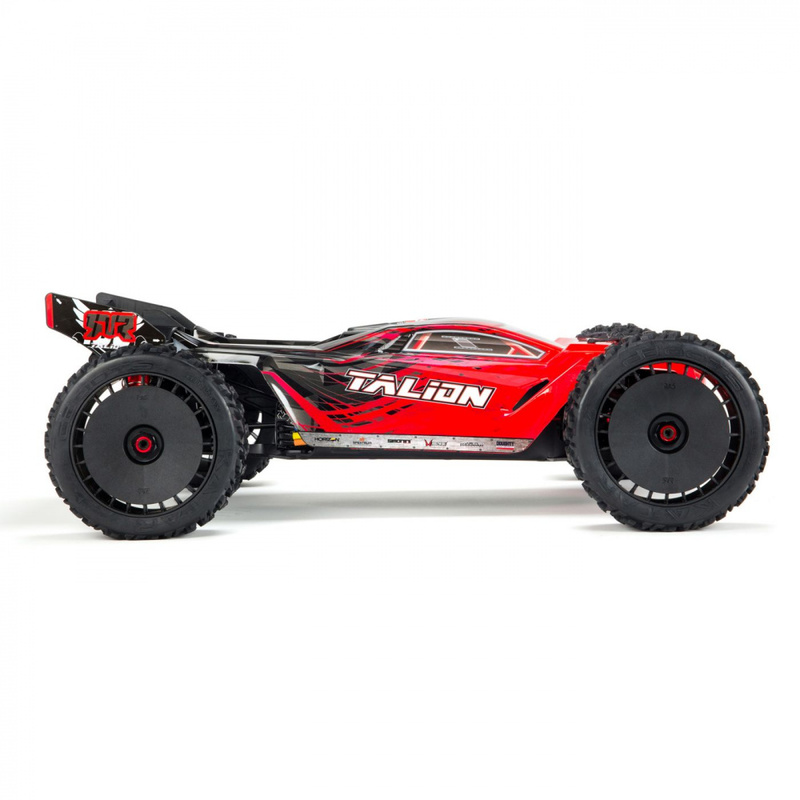 The TALION™ 6S BLX 4WD speed truggy blasts over dirt, rocks, asphalt, grass, mud, and snow - through all terrain and all conditions - with adjustable 16mm big bore oil-filled shocks soaking up the bumps. The shocks are mounted on low, black-anodized aluminum shock towers engineered for the truggy's low profile design. Included aluminum shock caps and protectors help maintain their super-smooth damping for supreme handling. 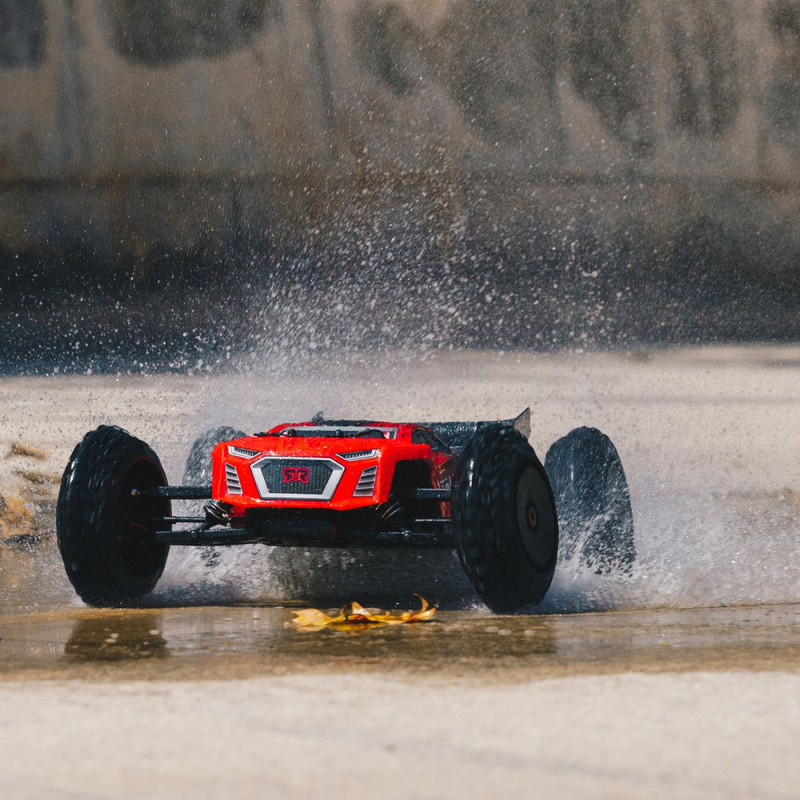 For the toughness needed to support its intense performance, ARRMA® builds the TALION™ 6S BLX 4WD on a strong, 3mm anodized aluminum chassis. Chassis components are all positioned to provide the best weight distribution for speed. Composite side pods, a center support and new aluminum center brace maximize chassis durability. All-metal diff outdrives and gearbox internals plus durable steel driveshafts contribute to an efficient, heavy-duty drivetrain that withstands extreme bashing. A new, "never loose" aluminum steering servo saver and "never pop" ball ends supply more precision, reliability, and confidence. 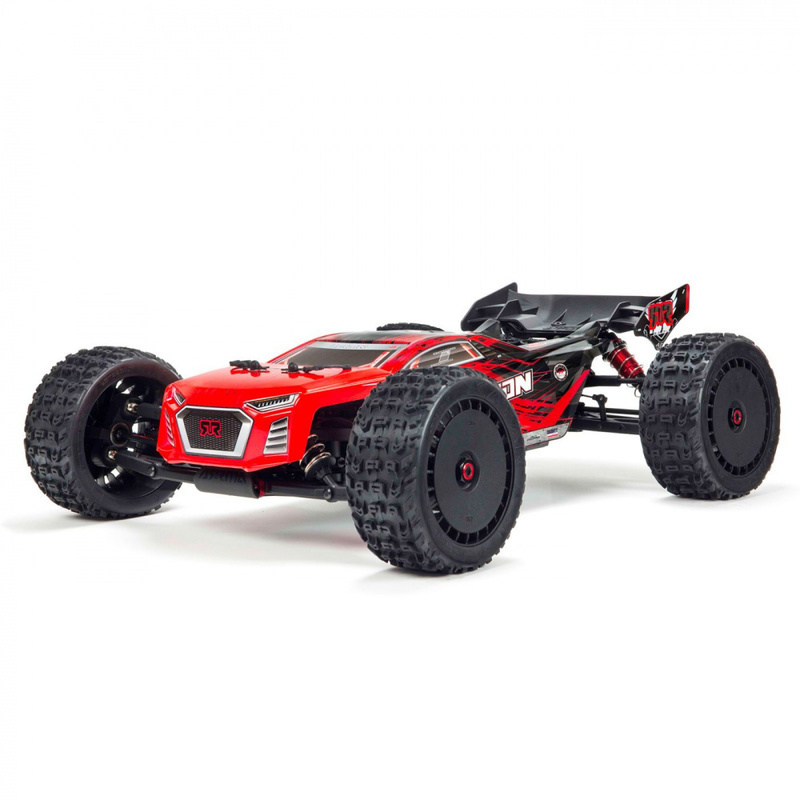 ARRMA® cuts your maintenance downtime to the bone with its smart, driver-friendly design. A sliding mount allows quick, hassle-free motor access. The center diff is easy to reach and can be removed by taking out just five bolts. Topping it all off is an aerodynamic truggy body that cuts through resistance for maximum speed - while its low profile helps keep the wheels planted and pouring on power. The ready-to-run TALION™ 6S BLX 4WD includes the new Spektrum™ 2.4GHz STX2® radio, with its SRX200 receiver and ADS-15M metal-geared servo factory-installed. The only required items are a 4S or 6S LiPo battery, compatible charger, safe charging bag, and four AA transmitter batteries. ARRMA® recommends the Dynamite® Powerstage™ Stage 6 bundle (DYN1540), which includes a Passport™ Ultra P2 100W AC/DC Multi-Charger and two Reaction HD 5000mAh 3S hardcase LiPo batteries with EC5™ connectors. New body includes forged composite details and a matte painted finish. New high-downforce wing includes strengthened wing mounts to take the hits and keep going. Low-drag MT wheels and multi-terrain DBoots® Katar tires for responsive handling, agressive driving, and fun in all conditions. Red anodized motor mount and mod 1 spur and pinion gears to handle increased speed and optimum performance.